Earlier this week, White House Press Secretary Robert Gibbs said that should Justice John Paul Stevens retire, a nominee would be offered shortly thereafter. "We'll be ready," Gibbs said. Gibbs and the Obama administration must now back up their talk. Stevens sent a letter announcing his retirement to President Barack Obama Friday. The immediate speculation as to who will replace Stevens centered on two female candidates: Federal Appellate Judge Diane Wood and Solicitor General Elena Kagan. Federal Judge Merrick Garland, a former high-ranking Justice Department official who is well respected and considered least likely to engender significant Republican opposition, has also been tossed around as a possible nominee. Does Obama want a Supreme Court Fight? According to CBS News senior White House correspondent Bill Plante, the administration has also hinted at at least one other candidate. All that doesn't really mean that these people are the short list, but it's a pretty good bet. - Does Obama want to name another woman, or a member of an ethnic or racial minority? - Would it matter to him, or anyone else, if the court were made up entirely of Catholics and Jews? Stevens is the only Protestant on the court now, and both Garland and Kagan are Jewish. - If a president's Supreme Court choices help shape his legacy, would he favor Kagan, the youngest of the three? - Does Wood, raised and educated in Texas, have an edge because she would replace Stevens, a Northwestern University law graduate, as the only justice without an Ivy League pedigree? If the president is casting a wider net, two Democratic governors - Jennifer Granholm of Michigan and Deval Patrick of Massachusetts - also could be considered. Because so little time has passed since last year's selection and confirmation of Sotomayor, both the White House and its political opponents are going over well-worn ground in evaluating Kagan and Wood. Obama interviewed them both before settling on Sotomayor. Wood has a paper trail of opinions that appears most likely to generate sustained opposition from Senate Republicans and conservative interest groups. Even as she was being considered last year, conservatives cited her opinion in a 2001 case that went against anti-abortion protesters who wanted to blockade clinics. The Supreme Court reversed the ruling. But Wood also has served for 15 years as a judge on the same court as two prominent conservatives, Judges Frank Easterbrook and Richard Posner. The 7th U.S. Circuit Court of Appeals is noted for its collegiality, despite ideological divisions, a point that could appeal to Obama. Stevens also served on the same appeals court before President Gerald Ford nominated him to the Supreme Court in 1975. Obama made Kagan the first woman to serve as solicitor general. Thurgood Marshall is the most recent of several justices who served in that role before joining the Supreme Court. Kagan, who has never been a judge, has made a half-dozen arguments in front of the justices in the past year. 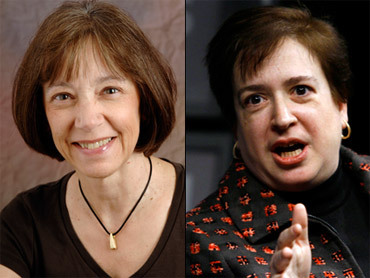 As the first woman dean of the Harvard Law School, Kagan won a reputation for hiring prominent conservative legal scholars and bridging disagreements between liberal and conservative faculty members. Yet 31 Republican senators voted against her confirmation as Solicitor General last year in what was seen as a warning to Obama should he want to put her on the Supreme Court. Kagan would likely face questions over her objections to campus military recruiters at Harvard, stemming from her disagreement with U.S. policy on gays serving in the military. Like Stevens, Garland was born in Chicago. He has been a federal judge since 1997, including serving for two years with John Roberts before he became chief justice. Garland and Roberts also served as young law clerks for the same appeals court judge in New York, Henry Friendly.